Exploding Woodchucks | It's a stupid website for jerks. It's a stupid website for jerks. – End users are trained to look for the green padlock, because if it’s there the page is secure! Comparing what it would take to try to get around those two issues, finding a way to inspect the traffic it probably going to be easier than re-training your userbase. – Write a notice script to look for certs that have your domain in them, but not your CA. Bro has a lot of these features built in, but not enabled by default. I’m going to show how to get these turned on so you can start tracking the SSL certs you see, and part 2 will be using the notice framework to take action when a cert meets that criteria that it’s likely malicious. The first command is one you add in to log every cert, and the other two you can uncomment to enable them. # certificate notary service; see http://notary.icsi.berkeley.edu . Once you edit your local.bro config, you’ll need to deploy the new configs which installs them and restarts the service. Finally, to check that everything is being logged appropriately, go to /nsm/bro/logs/current/ and look at x509.log and ssl.log. Now if you find a phishing site that is using SSL, you can search your Bro logs for that cert to see who has gone out to the site. In the next post, we’ll do some automation around this. So you set up a SSH honeypot and are gathering data, but what do you do with it? If you have Bro installed, you can integrate your feeds for monitoring in less than 15 minutes. I’ll show you how to pull a feed of your data from CSIRT Gadgets back down in a format that Bro can ingest and log (and alert if you choose) any time Bro sees any of the data in these feeds. I’m only setting up IP addresses in this tutorial, but you can output feeds of URLs, FQDNs, and even file hashes for Bro to use. If you’ve never used the Bro Network Security Monitor tool, check out Security Onion it’s great for a quick set up in a small environment, but if you’re looking to inspect multiple gigs of traffic you’ll likely want to configure your own environment. This tutorial uses Bro inside of Security Onion, but the concepts are the same if you installed a custom installation. The goal here is to pull your feed back down in Bro format, in order to do that you do that you need to install and configure the csirtgsdk client. Since you already created your CSIRT Gadgets account when you set up your SSH honeypot, you just need to log in and take note of an existing token or create a new one. Ubuntu 16.04 is straightforward, but if you’re running the Security Onion ISO it’s based on Ubuntu 14.04 and you need to manually install a newer version of python/PIP. You just need to update your system, and then install PIP and then csirtgsdk. Create a .csirtg.yml file under the users home directory. I run csirtg as root, so the file is just /root/.csirtg.yml. With your yaml file set up you should be able to run # csirtg --feeds to show all of the feeds your user has. With your csirtgsdk set up, you can run # csirtg --feed ssh-logger --format bro --limit 5 and it will output the first 5 entries in your feed in format for a BRO intel file. Create a feeds directory at /opt/feeds, and pipe the feed results to ssh.intel. You need to pull the feeds on a regular basis, because new data is always being added. In order to do this, set up a cron job to run every hour (I use a random minute so that the CSIRTG servers don’t get slammed by everyone at the same time. Edit the user cron with crontab -e and go to the bottom of the file and put something similar to this, but change the 18 number to a random number between 1-60. Now that the feeds are being pulled and updated, you need to configure Bro to read the intel file and set up logging/alerting. To do this, you need to enable the Intelligence framework, and the Collective-Intel policy script in Bro. Since we are pulling the feeds hourly, I set the intel feed entries to expire in Bro after 60 minutes. This way if an item is removed from the feed, it doesn’t stay forever. You just need to tell Bro where the intel feed files are, and to read the files in. After you edit the local.bro file, you’ll need to install/deploy the updated config. Bro reads the .intel files in real time so any time they are changed/updated you don’t need to do anything else for Bro to update the feeds as they come in. 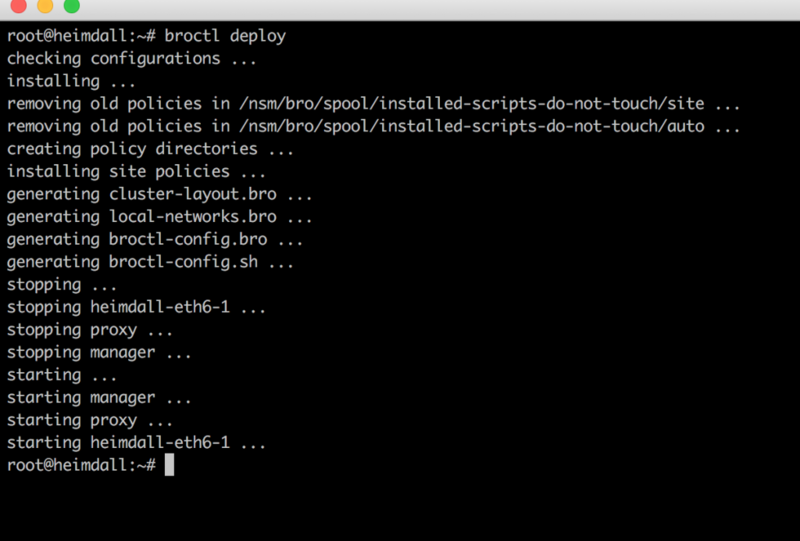 Just running broctl deploy will check the config, update broctl installation and config, and restart the services. Did you ever wonder who is trying to log on to your server? Here is how to set up a SSH honeypot inside of a Docker container that sends the data to CSIRT Gadgets using the Collective Intelligence Framework (CIF) in 3 steps. Sending the data to CSIRT Gadgets is great because you can then pull the data back down to be injected in to your IDS, or any other number of uses like by a SIEM for correlation. For those less trusting of scripts found on the Internet, I’ve detailed the steps below the video. Enter your CSIRTG username/provider/token when prompted. Once your CSIRTG account is ready to go, the rest takes less than 2 minutes! The video below picks up right after your CSIRTG account and token is setup. For those of you less trusting of scripts found on the Internet, here are the steps laid out for you. Go to csirtg.io and sign up to create your username. Create a feed called 'ssh-scanning'. Finally create a token for your account, you'll need this in step 6. Because ssh-auth-logger just logs any IP that tries to connect to it and outputs it to STDOUT we need to install the service files that configure csirtg-cef to tail the Docker container. - Edit the csirtg-docker.service file and change the provider and feed to whatever you set on csirtg.io and update --tail-docker to whatever you named your container. - Edit the darknet.env file with your csirtg.io username, token and use 'ssh-scanning' as the feed. Once the ssh-auth-logger container is verified to be running, start up the CSIRTG service. Finally, after it's been started, check it to verify it's running properly. If it's encountered an error and exited, you'll have to double check the configuration and/or other services to make sure they are running. © explodingwoodchucks.com ~ Making Woodchucks Go Boom Since 2017!